Mission: To inspire and enable young people, especially those who need us most, to reach their full potential as productive, responsible and caring citizens. Are you looking for a way to give back to your community? We're looking for volunteers to support our educational programming here at the Rainier Vista Boys & Girls Club. On average we serve roughly 200 youth, ages 5 to 18, per day from Rainier Valley. 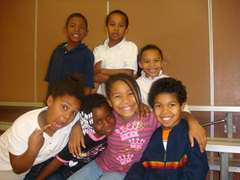 Education and academic success are key elements here at the Boys & Girls Club. We provide Club members with opportunities that incorporate high yield learning activities and focus on academic skill building. Your help is needed to encouragement youth to become self-directed learners. Our homework help program has two sessions per day Monday through Thursday and our tutoring program has two sessions per week on Tuesdays and Thursdays. For more information please contact Cat Buckley, the Community Engagement Coordinator at gro.ecalevitisop|reetnulovvrs#gro.ecalevitisop|reetnulovvrs or at 436-1893. Check out our website at http://rv.positiveplace.org/.